I’m no great fan of Blackpool, however in my responsible, grown-up years, there have been the few occasions where I’ve felt obliged to return to the West coast and endure the [excruciatingly and painfully long]odd weekend of Blackpoolshire…and all it has to offend, I mean, offer me… No disrespect to the residents or the many thousands of visitors to Blackpool, however, when you’re no more than a decade in age and you don’t even get a sniff of the Pleasure Beach, instead being dragged around the shops from minute one, then the thought of return trips recall an uncomfortable dread. Every year, mum and aunty Joan would sit down on the coach, with a flask of tea or coffee, an assortment of homemade sandwiches, a bag of barley sugars, a stock of sick bags, and, yours truly. Granted I might come back with a t-shirt sporting some cheap and tatty design, or maybe a bagful of candy rock, or sometimes cinder toffee, but this hardly compensated for being trawled from one shop to another by two bargain-hungry adults intent on going nowhere near the least little bit of entertainment – save for the odd game of prize bingo along the sea front shops. Little legs tired and boredom threshold reached and breached within a very short time, I guessed it would be an idea to entertain myself and pass minutes that seemed like hours as quickly as possible. Whilst in a big department store, somewhere near the tower, the name now escaping me, I lagged further and further behind mum and aunt. I did some perusing of my own and before too long I plodded on behind wearing a gentleman’s approximately size eleven shoe on my right foot and a pair of big, white, frilly, satin knickers on top of my trousers! I had terrible trouble trying to fasten the bra, having no knowledge of the intricacies of such apparel before I was discovered and the defrocking began! The shoe came off with a slight kick, the bra, whipped from my hand and my knickers pulled down to my ankles with disgraced haste! 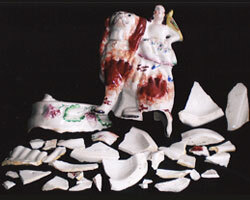 Unfortunately for me, dragging my normal shoe-shod foot through the knicker leg proved to be somewhat difficult and I lost all balance, fell, and came to rest amidst a pile of shattered porcelain ornaments of varying description! Ker-ching! £27 please, madam! This entry was posted in My Words and tagged blackpool, Bra, knickers, porcelain, shoes, tower. Bookmark the permalink.